40 ton overhead crane is the lifting equipment that is generally composed of bridges, lifting mechanisms, crab travelling and trolley travelling mechanisms, driver’s controlling room, conductive devices of crab, conductive devices of the crane’s main power supply and so on. The lifting mechanism of the bridge crane is the main part that is responsible for controlling the operation of the hook of the overhead crane during the ascent and descent of the hook. If we carefully check the parts of products in the ordinary course of work, we can speed up the work efficiency of production. There are many parts which often come in direct contact with the operator. So, we install some necessary safe devices to enhance safety and reliability. 40 ton overhead cranes adopt the international advanced standards manufacturing. The whole machine has many advantages of novel structure, beautiful exterior, good craftsmanship, flexible and stable operation, safety and reliability. If you are interested in our products, please get in touch with Weihua . We will provide you with excellent service. This product is widely used for the loading and unloading ordinary heavy objects. It can also equip with a variety of specific spreaders for special operations. When it is used in open air, it can equip with rain-proof equipment. When the client selects the size or type of 40 ton overhead crane, you should indicate the working system. In addition, you should give your requirements including working environment, temperature, power supply and other technical demands. Through different needs, Weihua can also design and manufacture the crane with a variety of foundations according to users’ requirements. When the product is used indoor, it also equips with some safe devices, which can increase the working process and protect the safety of products. The entire bridge of crane adopts the box type main beam, which improves the product’s safety and reliability when the equipment works. The crab travelling mechanism adopts the new conductive device of the I-steel track cable, which has good performance with safety and reliability. The lifting mechanism can also set up a second set of safety devices according to the users’ requirements in order to increase reliability. Components of 40 ton bridge cranes adopt the design with standardization, serialization, and generalization. The driver’s control room is open and the operator has good vision. All institutions of crane are finished in the control room, and the worker has the comfortable and flexible operation. The crane is a piece of mechanical equipment that we almost all have seen. 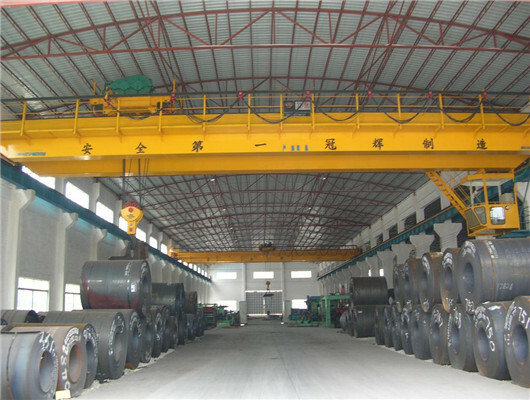 Sometimes, we can see that there are some overhead crane or gantry crane in construction sites, factories, warehouses, ports, or other working places. The crane can be divided into many types. We will introduce some wide usage products with explosion-proof double girder bridge cranes or European bridge cranes, single beam and double girder overhead cranes. If the customers want to learn more information about them, you can browse related websites. You can understand this device according to our related and specific introduction. Then, if you want to have the 40 ton overhead crane of high quality with a good device, you need to have a good accessory. Then, what is its working grade? The working level of the crane is determined by two kinds of capabilities. One is the frequent usage of the crane, which is called the crane usage level. The other is the ability of the crane that bears the load, which is called the load status of the crane. The crane has a certain total number of work cycles during the useful life. The work cycle of the crane operation is the entire work process from the start of lifting the items to the next lifting goods. We carry out lightweight design and research of cranes to form serialized products. 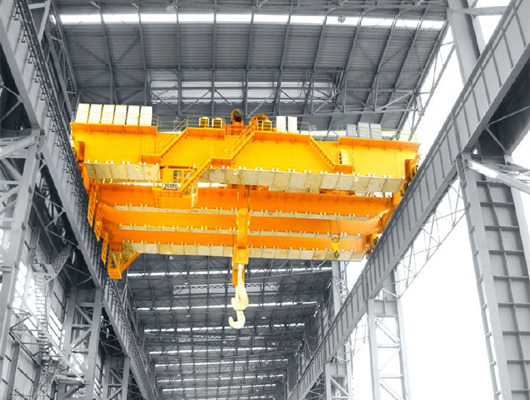 Weihua promotes the development of internationally advanced technologies such as lightweight, energy-saving, safe and reliable lifting machinery in China, which not only promotes technological progress in the lifting machinery industry, but also implements energy-saving reduction in construction machinery. We insist on the strategy which contributes to the development of low-carbon economy. In addition, the main lifting mechanism part adopts the modern modular high-precision design. This type of crane introduces many advantages of hardened surface, high load capacity, high accuracy, and compact structure. The equipment not only quickly loads and unloads various materials and but also supports heavy load forces. In this way, the 40 ton overhead crane can finish the task. This product makes the entire process faster, more accurate, and more intelligent, which not only improves production efficiency, but also reduces equipment capital investment. we use the international high-end technology with signal stability, and strong anti-jamming capability in conjunction with the upper computer control system. In addition, it has good performance with high precision, good stability, and long service life. The equipment escorts for safe production. 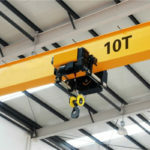 In addition, the overhead crane can finish an intermittent or repetitive work. It is lifting equipment that descends, lifts and moves mechanical materials through lifting hooks or other hoists. The lifting machinery has a large structure and a relatively complex mechanism. The shape of the hanging load is various; the load is varied; the operation range is large; the activity space is wide, and the working environment is complex. Many workers cooperate with each other in the working operation. For Weihua 40 ton bridge cranes, with various advantages of strong compact and special development for assembly and maintenance, theses designs require precise and smooth operation. This product combines into the latest technology in the field of mechanical, electrical engineering and automation. It can reach perfect material stacking, handling of heavy and fragile items, or easy maintenance work. What’s more, the 40 ton overhead crane still has the durability and adaptability, which is specially configured to meet your lifting requirements for specific operating requirements. If you have the special need, we can provide you with customized lifting equipment. Are you researching for the 40 ton bridge cranes or other overhead cranes? If you have some demands, you can call or email us. As the leading manufacturer and supplier in construction machinery in China, we can supply the clients from all over the world with various equipment. We have exported more than 60 countries and regions. All in all, if you want to order or purchase our products, please give us your quotation about 40 ton crane. If you still have some questions, you can contact us quickly. We will spare no effort to help you.